In the center of Tom and Lori Delia’s Charlotte garden, Romano bean plants climb a pyramid of wooden stakes, broad pods dangling toward the earth and tendrils bursting out on all sides like Medusa’s serpentine locks. Visitors who meander farther will see huge heads of verdant escarole and sunny squash blossoms attached to finger-sized zucchini da fiore. Much of this produce will end up on the tables of Trattoria Delia, the Delias’ cozy Italian restaurant that’s a fixture in downtown Burlington. Supplying a restaurant with produce from its own garden isn’t a new idea. Mary’s Restaurant at the Inn at Baldwin Creek and Shelburne Farms are two decades-old establishments where summer diners can take a stroll and see where the farm-to-table fare came from. But these days, the number of local eateries engaging in agriculture is swelling. While some restaurateurs simply grow a few pots of herbs for garnishes, and others, like the Delias, produce specialty items they can’t get elsewhere, still others strive to generate nearly all the seasonal vegetables they need. Whatever the scale of the agricultural endeavor, the benefits are clear. “I love that you can pick something during the day and incorporate it into a special that night,” says Tom Delia. 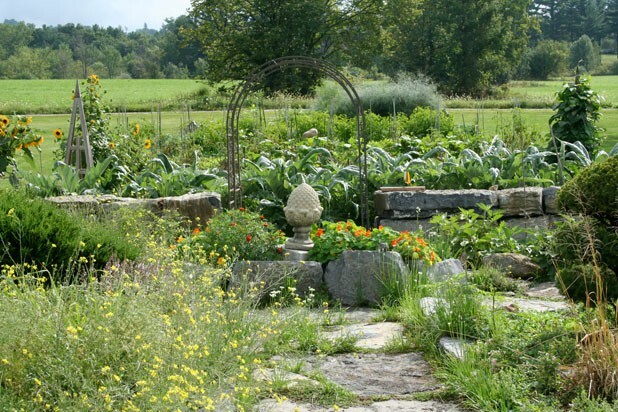 The Delias started their garden 10 years ago to cultivate heirloom varieties from the Old World. On regular trips to visit Tom’s Italian relatives, the couple tried crisp, sweet cucumbers as plump as baseballs, astringent greens and a particularly pungent Sicilian oregano. None of these could be sourced in the Green Mountains. In 2008, the Delias decided to expand their garden to just under a quarter acre, with the goal of supplying the Tratt as well as their home kitchen. For the past two years, they’ve hired an intern from the University of Vermont’s ag program to help with the weeding and harvesting. The Delias still buy much of the produce for their restaurant from Diggers’ Mirth Collective, the Intervale Food Hub and Black River Produce, but they work their homegrown items into the menu when they can. At the Tratt, for example, thin slices of air-cured bresaola beef might come with pickled fiddleheads and the thin, peppery wild arugula that sprouts in many of the garden’s nooks and crannies. A variety of freshly plucked herbs end up in Tom Delia’s bracing, home-brewed digestivi, too. And the Delias make sure diners know it. A blurb on the back of the restaurant’s menu announces the provenance of ingredients, and servers are trained to talk to customers about vegetables with which they may be unfamiliar, such as escarole and cardoons. Often, Tom says, diners are surprised to learn one can grow such exotica in a home garden. Sourcing produce directly from the garden requires kitchen staffers to make a few adjustments. For one thing, they need to get accustomed to using items that don’t always look picture perfect, no matter how good they taste. Tom Delia grins when he recalls that, early on, he caught his chefs using the specialty produce to make a family meal for the staff, because they didn’t think it looked uniform enough to serve customers. Now, he says, they use most everything. And what doesn’t go on the table — about 25 gallons of scraps per week — lands on the Delias’ compost pile. With help from Champlain Valley Compost Co. in Charlotte, says Tom, they’ve enriched their backyard’s heavy clay soil with nutrients. Backyard gardening was a natural business expansion for Sandy Lincoln, owner of Sandy’s Books & Bakery in Rochester. Her 12-year-old store sells used and overstocked volumes on topics relating to “sustainable agriculture and rural ingenuity,” she says. For the past five years, she’s also been serving organic fare in her small adjoining café. An abandoned field on the bookstore property gave Lincoln a chance to practice what her store preaches — by making it another link in the food-systems chain. The field became an 80-by-120-foot garden with seating under an arbor entwined with morning glories. “Our first year we just did potatoes,” Lincoln says. Now she grows and serves such items as Bull’s Blood beets, pineapple sage, tatsoi, black beans and edible flowers. She pairs them with meat and fruit from approximately 40 local purveyors, from full-fledged farms to foragers who show up at the back door peddling mushrooms or berries. Lincoln notes that gardening is a nice change of pace from running a business. “My life has been so busy, and to be out in the garden, playing in the dirt and planting things, is so good for the soul,” she says. It also seems to be good for business. “We cater to people who are very particular about their food,” says Lincoln, and adds that Sandy’s has helped make some converts. “I would say there’s a growing populace that seems to appreciate organic [food],” she says. And diners who like her local-ham-and-braised-cabbage sandwiches can always pick up a book on food politics or homesteading to go. While plenty of Vermont eateries maintain backyard gardens, a few have gone whole hog into food production — sometimes literally. Take Sugarsnap, a 6-year-old takeout and catering company with locations on Riverside Avenue in Burlington and at Technology Park in South Burlington. In season, as much as 75 percent of its produce comes from the company’s own three fertile acres in the Intervale. Farm manager Jen Miller uses about a third of the space for “intensive vegetable production,” says Sugarsnap founder and co-owner Abbey Duke. Another acre is dedicated to perennial herbs, shrubs and fruit trees, including pie cherries, currants, gooseberries and pawpaws. Seven pigs spend their halcyon sunset days on the final tract, which will be rotated into vegetable production next season. A flurry of food preservation is also happening right now at One Federal in St. Albans, where chef-owner Marcus Hamblett is up to his ears in dilly beans and other pickled and preserved vegetables. He’s turned 75 pounds of fresh basil into pesto — enough to supply the restaurant for a year. In fact, until the harvest slows, Hamblett’s ambitious garden will provide nearly all the produce for the 236-seat restaurant he owns with his wife, Erika. How did the former New England Culinary Institute chef-instructor end up farming as well as cooking? Hamblett explains that he has a dairy-farming background and the inheritance to prove it — a parcel of land in Holland, Vt. Back in the Reagan era, his parents participated in the government-sponsored “whole-herd buyout” program. Since then, their land — reserved for agricultural purposes by conservation easements — has lain fallow. Last year, Hamblett quietly put in an acre of vegetables as a trial run to see if growing produce for the restaurant was worth his while. When that went well, he quadrupled the fun: This year he’s got four acres in active production with the help of a full-time gardener, plus another acre cultivated by a St. Albans couple. A 20-foot greenhouse gave Hamblett an early start on the season. Where do you put that many tubers? One Federal is root cellaring, Hamblett explains cheerfully, “but I go through 1000 pounds per week, so I’m using them as fast as I’m digging them up.” Most of One Fed’s 2000 pumpkins and other winter squashes are still on the vine. Hamblett invested about $5000 in farm equipment this season, but, nevertheless, he guesses that this year his DIY approach will end up saving One Federal between $5000 and $8000. Next year, without the equipment costs, the margin should be even greater. The fact that his customers are cuckoo for his carrots and cukes hasn’t hurt, either. “It’s made us busier, because people like the fresh food,” Hamblett speculates. He says a surprising number of diners have noticed that the eatery’s signature “frickles” — deep-fried pickles — taste even better now that they’re made with homemade dills. Hamblett will probably plant a little less next year, he says, since this year’s crop exceeded the restaurant’s needs, but he won’t be less busy anytime soon. He has plenty of ambitious schemes in the works, including opening a brewery that will use hops from 75 plants already growing in his garden.